Dr. Ronald Copeland heads a concentrated effort to increase the racial and gender diversity of Kaiser Permanente's workforce. 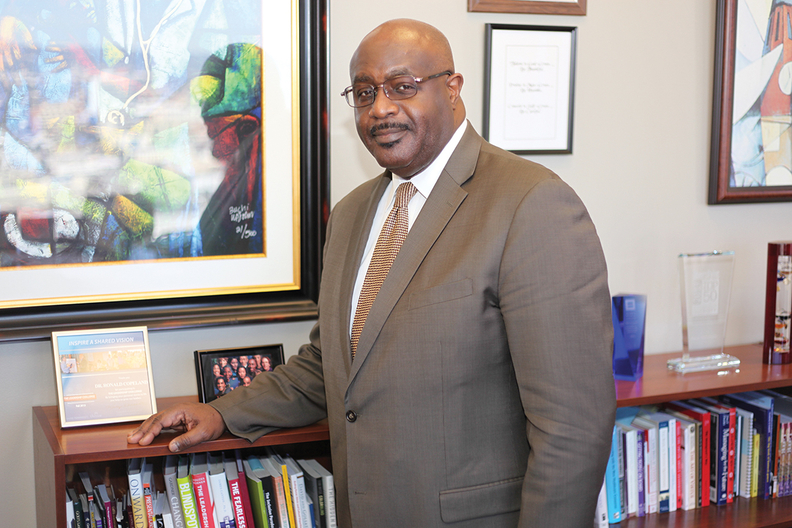 As the first chief diversity officer at Jefferson Health, Joseph Hill has big goals to transform the culture of the academic health system into one that's more inclusive. Hill wants all 28,000 employees at the 13-hospital network based in Philadelphia to feel like their ideas are valued and they can contribute to improvements at the organization. He also hopes that all workers—no matter their race, gender, sexual orientation, age or ethnicity—feel accepted and comfortable despite their differences. With health systems treating larger and more diverse patient populations, leaders are looking for managers focused on retaining a workforce that reflects the community. And-perhaps most importantly-he wants the employees at Jefferson Health to be as diverse as the population it serves. If the workforce represents the community, Jefferson can provide better care to its patients because it can leverage unique employee perspectives on meeting the needs and challenges of its service area, Hill said. "If we are going to be seen as the provider of choice, we need to have an understanding of the community," he added. 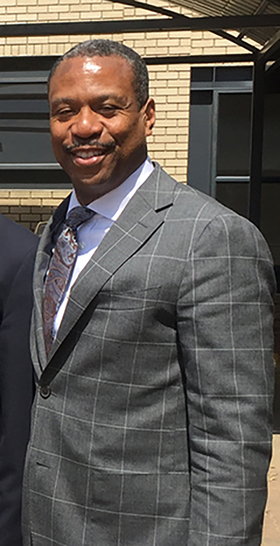 Hill is one of a growing number of executive suite officials dedicated to the promotion of diversity and inclusion at healthcare organizations. Hospitals and health systems are hiring chief diversity and inclusion officers to ensure the topics are a strategic priority from the C-suite down to front-line staff. Providers argue that as they care for a larger and more diverse patient population—both inside and outside the hospital setting—a diverse workforce will help them better care for patients. "We make it clear to our workforce that diversity is of high value to us," said Dr. Ronald Copeland, chief diversity and inclusion officer at Oakland, Calif.-based Kaiser Permanente. "It's not just a numbers game . . . we see value in our people and value the richness of their perspectives so they can become internal advisers and external ambassadors." The importance for healthcare organizations to have a chief diversity officer on board has grown in the past 10 years as health systems have expanded and their patient populations have become more diverse, said Tom Giella, chairman of healthcare services at executive search firm Korn Ferry. "Hospitals have morphed into health systems. . . . Because of that you are looking at a pool of patients that is geographically bigger," he said. The U.S. population overall is also changing. In 2010, the number of residents age 5 and older speaking a language other than English at home had climbed 158% to 59.5 million from 23.1 million in 1980, according to the U.S. Census Bureau. By 2044, more than half the nation is expected to be made up of minority races or groups, according to a 2015 Census Bureau report. "We live in a much more diverse country than we did 50-60 years ago," Giella said. "Organizations recognize they need to mimic the people they serve with their workforce." At Kaiser, Copeland heads a concentrated effort to increase the racial and gender diversity of the system's executive leadership and staff to better reflect its patient population. When new positions open at the organization, Kaiser leaders ensure a diverse pool of candidates are considered for the roles. Once employed at the organization, leaders make it clear that there are opportunities to advance, Copelan said. Employees are also encouraged to share their ideas to improve care and the overall patient experience, which promotes an inclusive workplace culture. The systemwide initiative is called Speak Up. In addition, educational courses are frequently provided to managers focused on how to manage a diverse workforce and patient population. The same AHA survey showed that 79% of hospitals educate all clinical staff during orientation about how to address the cultural and language differences of their patients. Kaiser employees are also surveyed to share their preferred gender and ethnicity identification as well as how they perceive the workplace culture. The efforts have helped Kaiser retain a diverse workforce. More than 60% of Kaiser's 208,000 employees are racial, ethnic or cultural minorities and more than 73% are women. "Employees know their unique ideas are valued," Copeland said. A chief diversity officer ensures the organization reflects the changing population and helps retain diverse new talent. They can even attract more prospective employees to the organization because it's a signal that an inclusive workplace is a priority, said Jennifer Bauer, a consultant at executive search firm Witt/Kieffer. "An organization with a chief diversity officer shows a commitment to diversity," Bauer said. "There are individuals who will look to see if there is a chief diversity officer" when they apply for jobs. In order to be effective, a chief diversity officer must have an understanding of the organization's culture and its patient population, Bauer said. "This is a role that accomplishes things through influence and relationships, not through authority, so it requires someone who is able to build strong relationships and communicate," she added. Jefferson Health's Hill said he sometimes drives to different neighborhoods just to talk to people and get to know them better. Experienced healthcare diversity officers can be hard to find, Korn Ferry's Giella said. The role is relatively new in healthcare so fewer professionals in the industry have the necessary background. Organizations will sometimes look outside of healthcare for diversity officer candidates in sectors such as education and government, he said. "It's a people-intensive role." Depending on the size of the organization, salaries for chief diversity officers can range from $170,000 to $350,000, Bauer said. This is in line with other senior executives at healthcare organizations, which she said is essential to show the role's importance to the overall leadership team and strategic vision. Gloria Goins, chief diversity officer at Bon Secours Health System based in Marriottsville, Md., spends much of her time ensuring employees leverage their unique differences to improve patient care. Bon Secours employs about 25,000 across its 19 hospitals. One tactic is the use of employee resource groups, which bring together workers who share the same background or interests to come up with new initiatives and programs that target specific patient populations. The health system serves a large veteran population in Virginia. The Bon Secours veteran resource group includes both employees who are veterans and those who are passionate about helping veterans get better healthcare. Group members often travel to various communities to assist veterans, whether it's serving hot meals to the homeless or helping them locate housing. "An integral part of who we are at Bon Secours is to provide culturally competent care," Goins said. "The idea is to really meet people where they are, and the ability to bridge across all kinds of cultures including age and religion." Hill at Jefferson Health, who now has nine people on his team, held focus groups with patients to get a better sense of what they expect from their healthcare providers, and how they view Jefferson Health. "People make assumptions, and a lot of the time those assumptions aren't true," Hill said. The effort has helped Jefferson Health better target health disparities in local communities, particularly among the homeless and low-income populations. 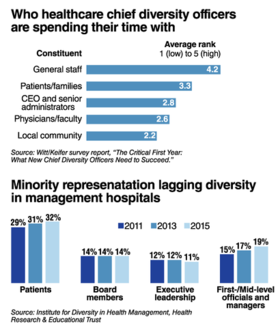 Although the goals of chief diversity officers align with important overall strategic missions of healthcare organizations, it might still be hard to get buy-in and support for their efforts, Bauer at Witt/Kieffer said. "I think the challenge for a chief diversity officer is that your work isn't directly attributable to market share or revenue . . . so you need to be able to develop a strategy to lobby for the resources and have conversations with the CEO around what types of resources are available," Bauer said. Elizabeth Appling, chief diversity officer at Chattanooga, Tenn.-based Erlanger Health System, said it can be hard to keep diversity top-of-mind in the C-suite. To combat that, she's identified executive leaders who support her goals and will help sponsor them. "Identifying ways to secure leadership buy-in is constant," she said. Another challenge is that strategic goals take awhile to achieve so chief diversity officers need to practice patience. "The reality of it is when you do this work you recognize it is not a sprint, it is an ongoing rigorous process," Goins said.